Life on the farm with Granddaddy is full of hard work, but despite all the chores, Granddaddy always makes time for play, especially fishing trips. Even when there isn’t a bite to catch, he reminds young Michael that it takes patience to get what’s coming to you. One morning, when Granddaddy heads into town in his fancy suit, Michael knows that something very special must be happening—and sure enough, everyone is lined up at the town hall! For the very first time, Granddaddy is allowed to vote, and he couldn’t be more proud. But can Michael be patient when it seems that justice just can’t come soon enough? This powerful and touching true-life story shares one boy’s perspective of growing up in the segregated South, while beautiful illustrations depict the rural setting in tender detail. Michael S. Bandy is the co-author, with Eric Stein, of White Water, which was adapted into a screenplay that awarded the authors a Bill Cosby Screenwriting Fellowship. He lives in Los Angeles. Eric Stein, co-author with Michael S. Bandy of White Water, has written for the children’s TV series Star Street. He lives in Santa Monica, California. James E. Ransome is the illustrator of many books for children, including Sweet Clara and the Freedom Quilt, Let My People Go, and the Coretta Scott King Illustrator Award winner The Creation. James E. Ransome lives in Rhinebeck, New York. 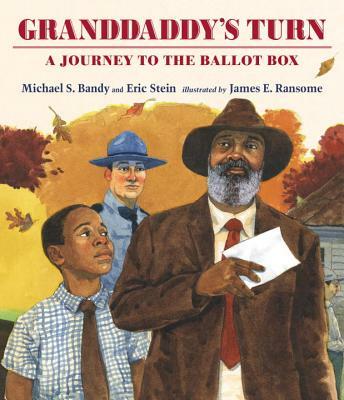 The accomplished illustrator James E. Ransome renders the story in warm, realistic watercolors...It’s a message so crucial it almost can’t be delivered with too much sentiment, and the authors and illustrator of “Granddaddy’s Turn” spare none. This seemingly simple read-aloud to introduce young readers to the 50th anniversary of the Voting Rights Act achieves complexity in its images. A visually detailed tale of patience and delayed triumph that highlights an important aspect of history. The plainspoken text offers a slice-of-life example of the injustices endured by African Americans during the mid-twentieth-century. Bandy and Stein succinctly explore a close family bond, set against historical injustice. Ransome’s emotive watercolors strongly convey the grandfather’s dignity and Michael’s quiet pride as he reaches a milestone that was kept from his forebear. accurate period details, and the faces of onlookers telegraph the prevailing attitudes of the time. The poignancy of the story is enhanced by the warm, earth tones of the watercolor illustrations, as readers experience the lives of the grandfather and the child. Certain to spark a lively discussion on the 1965 Voting Rights Act.